anti-bacterial | What's Green with Betsy?!? I’ve just discovered the most wonderful product called Bee’s Wrap. Handmade in Vermont by a young mother and her team, it’s the perfect alternative to plastic wrap for food storage. Bee’s Wrap is made from organic cotton muslin infused with beeswax, jojoba oil and tree resin. The anti-bacterial properties of beeswax and jojoba oil keep the food fresh and allow the wraps to be used over and over. 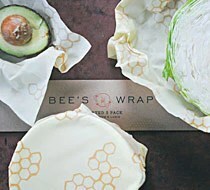 Use Bee’s Wrap to wrap sandwiches, cheese, baked goods, bread, a half avocado, cucumber or lemon, or to cover a bowl of leftovers. It is not recommended for meat. With the warmth and pressure of your hand, the malleable sheet easily molds around the food to create a seal. To reuse, clean with a mild soap and air dry. With proper care and usage, it should last up to a year. 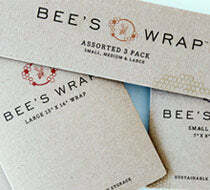 Bee’s Wrap comes in five sizes – small, medium, large, bread, baguette, and an assorted 3 pack. Not only do food and plastic not go together, plastic wrap is not easily recycled. Here is at last a clever, easy, reusable and safe alternative for food storage. Congratulations to this creative young entrepreneur! Minimally and attractively packaged, Bee’s Wrap can be found on line at beeswrap.com and at natural food stores and specialty shops all over, even internationally. For you readers on Cape Cod, Farm Fare Market at 68 Tupper Road in Sandwich carries them.